The comet Elenin is passing through the inner solar system right now and will make its closest approach to Earth on Oct. 16. The comet has sparked an Internet firestorm among believers who claim its approach is linked to Earth's destruction, a rogue "planet" called Nibiru and a NASA conspiracy to cover it all up. Now NASA is stressing the simple truth: Comet Elenin is just an icy comet — and a wimpy one at that — which poses no threat to our planet. Take, for example, Elenin's "close" approach to Earth. That closest point is still out in deep space, a distant 22 million miles (35 million kilometers) from our planet, NASA scientists explained in a statement released yesterday (Aug. 16). That's more than 90 times the distance from the Earth to the moon, they added. The speculations by comet Elenin doomsayers claiming that the comet will align with other planets or celestial bodies to wreak havoc on Earth are just not true, the space agency says. "Often, comets are portrayed as harbingers of gloom and doom in movies and on television, but most pose no threat to Earth," NASA officials said. "Comet Elenin, the latest comet to visit our inner solar system, is no exception." Comet Elenin was discovered on Dec. 10, 2010 by astronomer Leonid Elenin of Lyubertsy, Russia, who made the find using a remote-controlled observatory based in New Mexico. At the time, the comet was about 401 million miles (647 million km) from Earth. It is fairly faint and not expected to dazzle skywatchers, NASA scientists have said. Since then, the comet (officially known as C/2010 X1) has made its way into the inner solar system, giving rise to many rumors — some outlandish — that link comet Elenin to 2012 end-of-the-world theories and other disaster scenarios. Will comet Elenin block out the sun, causing three days of darkness? No, the comet won't cross the face of the sun as seen from Earth, and even if it did it's much too small to have an effect. Will the comet pass between the Earth and the moon? No, it will be 90 times farther way. Will comet Elenin cause shifting tides or earthquakes on Earth? Not at all. For that last one, Yeomans stressed that there is absolutely no way Elenin could affect life on Earth, aside from providing a target for skywatchers to gaze at with telescopes. "So you've got a modest-sized icy dirtball that is getting no closer than 35 million kilometers [about 22 million miles)," Yeomans explained. "It will have an immeasurably miniscule influence on our planet. By comparison, my subcompact automobile exerts a greater influence on the ocean's tides than comet Elenin ever will." 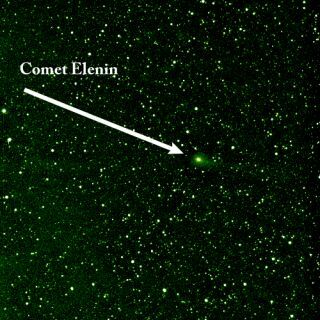 Comet Elenin and a hidden object? Another theory rampant on the Internet is that comet Elenin is actually a type of failed star known as a "brown dwarf," or could be affected by another unknown planet or star, such as a rogue object called Nibiru suggested by many believers or brown dwarf star. NASA received questions on that as well. "A comet is nothing like a brown dwarf. You are correct that the way astronomers measure the mass of one object is by its gravitational effect on another, but comets are far too small to have a measureable influence on anything," said David Morrison of the NASA Astrobiology Institute at the NASA Ames Research Center in Moffett Field, Calif.
And another scenario — that a brown dwarf, or even a so-called "black dwarf" star, could be hidden from NASA's view — is also not possible, Morrison added. "If we had a brown dwarf star in the outer solar system, we could see it, detect its infrared energy and measure its perturbing effect on other objects," Morrison said. "There is no brown dwarf in the solar system, otherwise we would have detected it. And there is no such thing as a black dwarf." According to NASA, the best time to spot comet Elenin in telescopes will be in early October. Binoculars or telescopes are required because of the comet's dim appearance. Whether the comet will be visible to the unaided eye, however, remains to be seen. "This comet may not put on a great show. Just as certainly, it will not cause any disruptions here on Earth. But, there is a cause to marvel," Yeomans said in the statement. "This intrepid little traveler will offer astronomers a chance to study a relatively young comet that came here from well beyond our solar system's planetary region. After a short while, it will be headed back out again, and we will not see or hear from Elenin for thousands of years. That's pretty cool." You can read NASA's full transcript of comet Elenin questions and answers here.